Baked sturgeon is one of the delicious dishes that will enhance any table. Useful properties of this fish are enormous, but, despite its belonging to the elite classes, to prepare its not so difficult. The majority of sturgeon can be baked according to the same recipe that and that other noble fish. Before how to roast sturgeon, peel and rinse it. It is not forbidden to put fish in pan whole, but pieces of it actually cooks much faster and is immediately ready for portion serving. So this recipe is perfect for those who want to quickly prepare a delicious dish, not fearing for his appearance. Cut the fish into pieces not thicker than 2cm, otherwise it will not evenly grilled. Then brush the steaks with a mixture of lemon juice with a few drops of vinegar, vegetable oil, black pepper, salt and herbs of marjoram or thyme. If time allows, leave the fish to marinate in this mixture, leaving it in the fridge for a few hours. For each piece of fish to make an envelope of foil. For this cut the fragment with a size in excess of twice the steak with the height of bumpers. Fold the foil in two layers, creating small semblance of a small saucer. Inside additionally to grease bottom of foil with oil is not required, the fish initially saturated with it and will not burn in the cooking process. 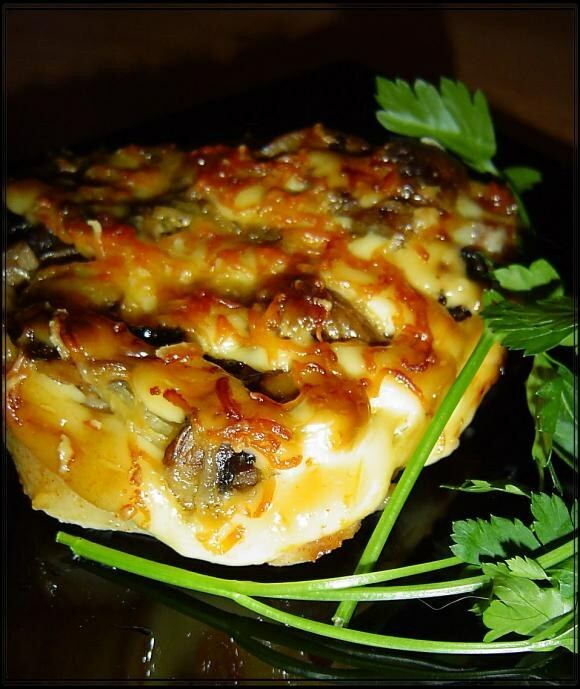 Cut the mushrooms into slices with a thickness of a few millimeters, sauté them with onions, chopped semirings. To bring to readiness of vegetables is not required, only need to lightly fry them, get the crust. To do this, just a few minutes. Lay a piece of fish, she put a tablespoon of the mixture of mushrooms and onions, a wedge of lemon, peeled from the peel. Add a teaspoon of sour cream, otherwise the dish can get a little dry. Cover the fish on top with a piece of foil to keep the appearance, and put in the oven, preheated to 180 degrees. Sturgeon, baked in the oven, will be ready within 20 minutes. 5 minutes before shutdown, remove the foil so the fish has formed a crust. If you wish, sprinkle the steaks with grated cheese which will make the steak more spectacular, but you can do without it. Serve this sturgeon in the same portions of the plates from the foil and garnish the top with branch of fresh dill.